Based on the best seller by James Bowen, and consequently the true story of Bowen's recovery from homelessness and drug addiction with the help of his ginger tom companion, A Street Cat Named Bob is an interesting tale that, for the most part, finds an ideal balance between staying loyal to the book and being creative in it's own right - even if, from a filmmaking perspective, there are some key flaws from aesthetic and pacing perspectives. The story covers Bowen's (Luke Treadaway) struggle with homelessness triggered by his severe drug addiction, and consequently the loss of his family's love and trust. With little hope even after he is provided a temporary home by the council, Bowen soon meets and befriends an equally lonely ginger tom, adopting it as his own under the name Bob. With Bob's love and company, Bowen soon finds his prospects taking a sudden turn, being driven with a newly found confidence to return to the dignified self he desires to be. With the main relationship between a man and a speechless cat, it surely wasn't an easy story to adapt, but for the most part, the creators have done a admirable job; Bob's personality is captured well through a lot of charming behaviours demonstrated by the feline in question (portrayed by the real Bob himself) and, even if the POV camerawork is sometimes a little clumsy, the way he and Bowen interact is well portrayed and both funny and touching on many occasions. However, human interaction is far from absent - Ruta Gedmintas joins the narrative as newcomer Val, the animal loving neighbour of Bowen. She plays the part well for the majority of the film, providing comic appeal and an upbeat vibe whenever she arrives on screen, but her unstable focus in the overall script makes her a little uninteresting at times - her bond with Bowen is also not as strong as it could've been when you consider what the filmmakers were aiming for. The same can also be said for Bowen's father Nigel, played by Anthony Head, who stars in a fantastic emotional scene as we near the film's end but sometimes lacks the development required to draw us into the connection between him and Bowen. 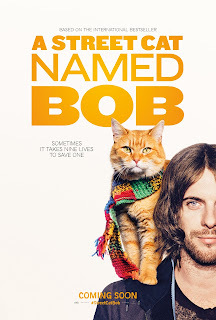 But A Street Cat Named Bob has many heartwarming moments - namely when we see Bowen, portrayed brilliantly by Treadaway, roaming the streets in search of food or coin, as well as the abuse he receives from those more fortunate than himself. His growing love for Bob is also extremely touching as their relationship begins to develop, thanks to a combination of strong development and Treadaway's performance. Such scenes feel over the top or cliché, but at the same time, are effectively crafted to make you sympathise with an unfortunate character based on a real figure and connect with the love he shares with an equally unfortunate pet. The only central issue with the film is pacing - it can sometimes be clumsy and unsteady, with some scenes lacking the development they deserve, and others feeling slightly unnecessary. Some of the acting from the extras can also feel a bit tacky, even if they are on screen for hardly any time at all. In spite of these flaws, A Street Cat Named Bob remains an endearing film and a pleasant adaptation of the book, and a film that's worth seeing for those wanting naught but a touching and somewhat informative tale without any unnecessary Hollywood complexities.